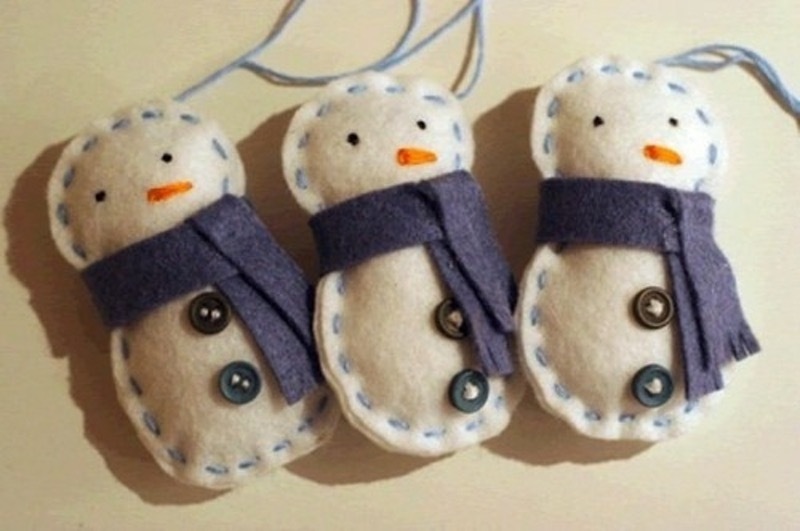 Here is a cute little project that is easy enough for children to do, the supplies you will need are available at most dollar stores, white felt, blue felt and your choice of colours for the scarf. A package of little buttons, you can embellish with stars or sequiens, or any little extras you like. The pattern could easily be drawn on a paper to made the size and shape you are wanting. 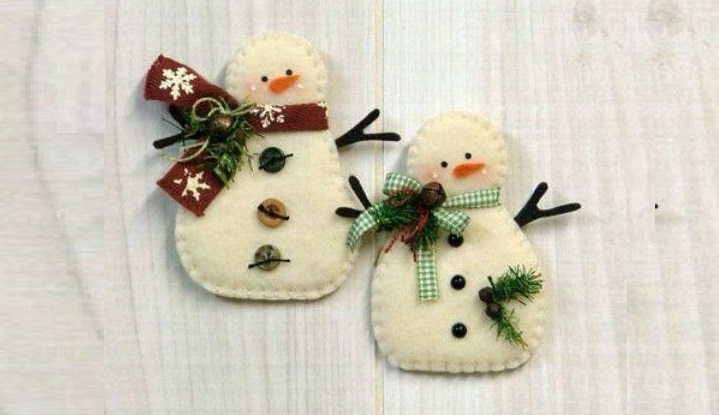 A little bit of yarn or embroidery thread to do the hand stitching, and a felt pen to draw on the carrot nose and the little black eyes, or if you are a stitcher you might want to embroider the carrot nose and little black eyes, you can use your imagination to make it your own design. 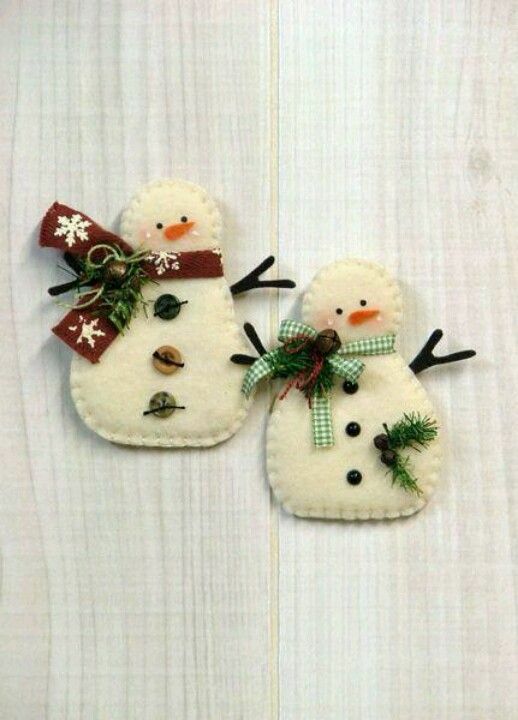 Have fun, nice for hanging on the tree or to add to a gift, tuck into a box of homemade cookies, enjoy. There is no pattern that I could find for this oHave funne, but the images seem to have originally come from a website called TheBest. Wondering what to do when the kids are home for the summer? There are plenty of ideas for a variety of projects and games online, but one of our favorites sparks the imagination of fantasy lovers everywhere, whether you’re a kid on summer vacation or an adult sitting down to play a tabletop RPG with friends. This project is relatively simple, but the results are incredibly stunning, and can be personalized with the intended recipient’s favorite colors. If you or your kids love dinosaurs, dragons, and other mythical egg-laying critters, then this craft is for you. Whether you’re a diehard Harry Potter fan, a Game of Thrones fanatic, or re-reading Anne McCaffrey’s Dragonriders of Pern, there are plenty of dragons in our literature, but hardly any really detailed descriptions regarding dragon eggs. This is actually a good thing, since we are free to utilize our imagination and create our own versions of the dragon eggs we’ve read about or watched in everything from Eragon to How to Train Your Dragon. The base begins with aluminum foil. The purpose of the foil is to help retain shape while the decorations are being added to the egg, with the added bonus that it allows for the use of less clay, which means more dragon eggs. After that, press the clay on, and roll around until you get the desired shape. After that, press the decor on and wait for the clay to dry. You may want to consider purchasing or making a basket or other container for the express purpose of a nest. After that, it’s time to show off those fabulous creations! Ready to make your own batch of dragon eggs? You can find the complete tutorial, along with photos and a link to mermaid eggs, here. Do you recall the first time you encountered your first piece of macrame? Was it at summer camp? Or perhaps in your aunt or grandma’s spare bedroom? Or are you new to macrame and want to jump in and join while it’s enjoying a refresh? Wherever you learned about or saw macrame, it’s a classic craft that has been around for decades. These days, people are putting a twist on the old favorite and re-imagining it with all sorts of string and cord sizes, in all shapes, and any color under the sun. And what better way to show off your newfound skills than with a wall hanging? In macrame, the most basic form uses four strands of string (or yarn, cord, ribbon, whatever suits your fancy) to make different types of knots. This wall hanging multiplies the one strand by 7, allowing for strands to be interwoven or kept separate as the pattern continues. You can either follow the instructions to the letter or you can have fun trying out your own design once you become familiar with a few simple knots. The completed wall hanging features 25 rows of knots as well as a line of fringe. There are written instructions as well as photos to help you finish up the project. Once you’re done, you can decide where you want to place the wall hanging – in the spare bedroom, in the living room, kitchen, or even by the front door. It also makes a great house warming present for new neighbors, newlyweds, or teachers. Want to show off your knot knowledge and know how? You can access the free pattern at My French Twist.